Our next Tea Time At Reverie comes courtesy of Sanctuary T. This New York City tea shop sells a number of its straight loose-leafs and artisan tea blends at their online store. Notice I said “tea shop.” Yes, you can visit Sanctuary T’s restaurant for just about any meal of the day, or make reservations for afternoon tea. Their menu features a neat selection of creative yet familiar dishes to match the cozy tearoom environment. I may have to pop in there the next time I’m in the Big Apple! One of the teas I was thrilled to try from Sanctuary was their Chocolate Honeybush Tea. Haven’t heard of honeybush before? It’s a flowering plant grown in South Africa that was named after the honey fragrance from its blossoms. It differs from the more well-known rooibos (also cultivated in South Africa) with darker, coarser root pieces and a fuller body. While I already like honeybush tea, I bet you’ve already guessed the reason I asked for this sample: chocolate! So, how well do these two indulgent flavors combine for this dessert tisane? Steeping Instructions: Use 1.5 teaspoons per 8 oz of water. Heat water to boiling (208 degrees Fahrenheit / 97 degrees Celsius) and steep for 5 to 7 minutes. Dry honeybush roots have a naturally reddish-brown, woody look. However, I was surprised at how dark Sanctuary T’s Chocolate Honeybush appeared in the sample bag. Maybe the chocolate bits enhance the brown tones a little more. The dark background also allows the pink rose petal specks to stand out visually. Now, considering this drink’s name, guess which smell delighted this tea and chocolate lover as soon as she opened the bag? Ohhhhhhhhhh yes! It’s not a sugary chocolate scent, though. Instead, It’s more like cocoa, raw and slightly nutty. The wood and honey notes from the honeybush also bloom through, giving this blend a warm and unique sultriness. I can’t detect much of a rose scent… but let’s see what happens when I make my brew. For my first cup of Chocolate Honeybush, I steep about 1.5 teaspoons in 8 ounces of nearly boiling water for 5 minutes. (I prefer to make my herbal teas with water of 195 degrees Fahrenheit [90 degrees Celcius] instead of 208.) The vibrant reddish-brown infusion is gorgeous and tantalizing, especially with the wood and cocoa notes whispering at my nose. 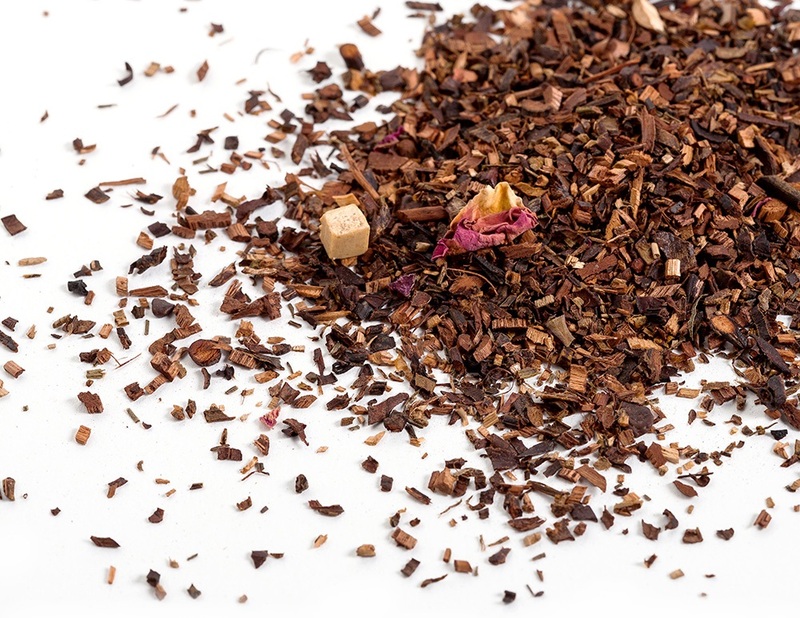 Flavor-wise, this tisane offers equal amounts of cocoa and honeybush, followed by a delightful bittersweet finish. The cocoa complements the wood tones surprisingly well and gets an unexpected boost from the roots’ natural sweetness. I still don’t smell or taste much from the roses, but the lack of either doesn’t detract from the drink. Tea lovers with a “chocolate tooth” are bound to appreciate Sanctuary T’s Chocolate Honeybush. This full-bodied herbal pleasure maintains the signature honeybush taste while introducing a healthy dose of cocoa. This combination may seem odd in theory, but once it’s in your cup your senses will purr with gratitude. The rose petals are more or less an aesthetic; they don’t add much to the infusion. Nonetheless, Chocolate Honeybush is a delectable, calorie-free, and reasonably priced treat that would pair deliciously with non-chocolate cheesecakes, tiramisu, or your favorite cookies. Possible Book Pairings: If Chocolate Honeybush helps one avoid temptation, perhaps the book choices should lure you back to the dark side. Try this tisane with Jacqueline Carey’s Kushiel Legacy series (adult fantasy) or Paulo Coelho’s Eleven Minutes or The Devil and Miss Prym (metaphysical / fiction). You can purchase Chocolate Honeybush directly from Sanctuary T here. Ever thought chocolate and tea couldn’t pair well together? Sanctuary T has just the tisane to challenge that idea. Their Chocolate Honeybush Tea blends the woody, naturally sweet flavors of the African honeybush root with bittersweet cocoa. Read on to find out more of my thoughts on this guilt-free pleasure!